Although I do not agree with many of the decisions made by the government of the United States, I believe it is necessary to punish those who planned, prepared and executed the plans which made hundred of thousands innocent people suffer. I know that the terrorist who piloted the airplanes who crashed into the World Trade Center, the Pentagon and the terrorist who piloted the machine which was brought down before another attack could be executed, can’t be punished. However, I hope they will burn in hell, even though I do not believe in God. I know that some of the terrorists who pulled the wires got caught and punished or were killed in firefight. I hope that the 2,974 people who died as an immediate result of the attacks will rest easier . I hope that their relatives, friends and loved ones have it easier now, but I know it will never be like it was before. I can’t do much. I can only hope that this article reminds everyone of this cruel day. I still remember how I came home from school and switched the TV on to watch J.A.G (a series) just to see the news. At first I didn’t believe it, but then I realized: This is not a „joke“. This is real. Those planes did crash into the WTC. One image I will never forget. The image of people jumping of the World Trade Center. I do not know why they decided to jump. I only know they made a decision and no one will ever understand their decision. I do not know how I would have reacted if I would have been in one of the Towers, or even in one of the planes. I only know when, where and how I learned about what happened. Update: Tay Zonday published a great song on YouTube. You can watch it after the jump. Dieser Eintrag wurde veröffentlicht in Others, YouTube und verschlagwortet mit 911, Video, YouTube von Marco. Permanenter Link zum Eintrag. Thank you so much for your kind words on my 911 post. And thank you for caring enough to post on your own even though you are not here. 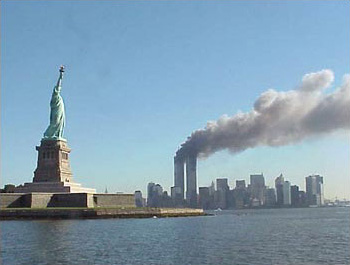 It is nice to know that even if people don’t agree with US actions- they sympathize with the loss felt on that day. Also thank you germany for the terrorists you recently caught. the world should be thinking you greatly.